Under the direction of Maggie Maguire, the band began competing at senior level in 2009 and had a successful run, winning its first Ulster title and reaching the All-Ireland Fleadh. Year after year, the Knockmore continued to gain support throughout Ireland and were identified to be a serious threat to the more established and experienced bands in the competition circuit. Performances were always of the highest standard and as the years wore on, expectation started to rise. The band’s most satisfying performance came in 2012 at the All-Ireland Fleadh in Cavan. Although not placed in the top three, it was the first time the band members believed that lifting that coveted trophy was a possibility. A just reward for the band came in November of 2012 when they finished 2nd in ‘The Ennis Trad Fest Ceili Band Competition’ overcoming many seasoned bands from throughout Ireland and Britain including competitors who had been placed ahead of them at the All-Ireland Fleadh months before. Going into the 2013 Fleadh season, the Knockmore now came with a strong favourites tag to lift the famous Harp. It was an historic year for Comhaltas – the first time in All-Ireland Fleadh history that the festival was taken north of the border to the city of Derry. It was also an historic year for the Senior Ceili Band competition… Drama ensued when the marks from the five independent adjudicators were totalled and left two bands – The Moylurgh from Roscommon and the Knockmore – tied for first place. This resulted in the infamous ‘recall’. Unfortunately, the Knockmore were pipped to first place in a split decision and resigned to second place. 2014 began as 2013 had finished. The Knockmore were this time obvious favourites to clinch the title at the All-Ireland Fleadh in Sligo. The hours of practice were put in, the tunes picked, and a change of uniform was used to ‘brighten up’ the band. With all the pressure of the packed hall watching, the TV cameras focused and the adjudicators in place, the Knockmore delivered an outstanding performance to finally reach the holy grail and be crowned All-Ireland Champions for 2014. The Knockmore bridged a 29-year gap to become only the second ever ceili band from Northern Ireland and indeed the province of Ulster to lift the trophy – the other being of course the Pride of Erin in 1983 and 1985. The band has featured extensively on TV and radio, most notably the TV documentary ‘Fleadh’ (BBC 2013) and ‘Stair na mBannai Ceili’ (TG4 2011). 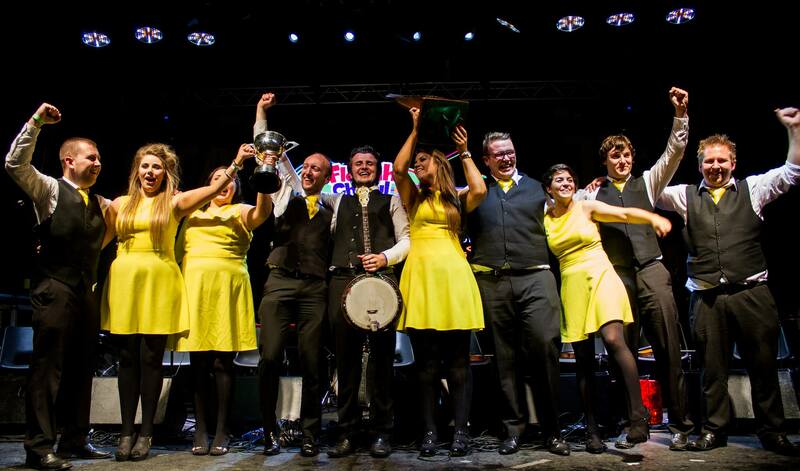 The Knockmore Ceili Band are enjoying their year as All-Ireland Champions and are delighting audiences throughout Ireland and Britain with their energetic music and infectious enthusiasm.